In fairness, we did think that, perhaps, not everyone is as excited as we are about the launch of the next iteration of the Nexus 7 tomorrow (which we'll liveblog, by the way!). But then we thought that that's just nuts – what is there not to love about the Nexus 7 II? From the price tag, through the truly impressive specs and down to its privileged status of a Nexus device (meaning timely updates), the Google/ASUS duo and its second joint venture scream exciting however you look at it. With the clock ticking, and with you having shown a considerable interest in the various exploits of the upcoming tablet, now seems like a perfect time for a recap on what we think we know. Luckily for all involved, it won't be long until we have an official confirmation (or refutation) of those. Now that we've settled on those prior accounts, we invite you to the gallery below for a journey through all there is to know about the new Nexus 7. 1080p resolution, in a 7-inch tablet? Oh yeah! In case you're bad with numbers, that comes out to a crisp 323 pixels per inch (PPI). That's up from its predecessor's 720p, 216 PPI display – a solid improvement, no doubt. 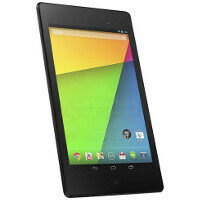 The Nexus 7 II differs from its predecessor physically in several regards – the device is more narrow, but taller. Additionally, the backplate has a brushed plastic look, unlike the older Nexus' spotted back. Also note the addition of an extra speaker on the top of the device – an upgrade from its forerunner. You probably noticed already – the new Nexus 7 II will have a rear (5MP, purportedly) camera, unlike its predecessor (which lacked one altogether). Up front, the device hasn't changed too much – the 1.2MP front-shooter has been relocated from the center to the right side of the device and an LED light has been added to help you keep track of notifications. That's all fine and dandy, but by now you're probably itching to know a bit more about what exactly is running this entire show underneath. Well, the suspense was worth it, for the Nexus 7 II is a hardware beast. As you can see, a quad-core processor clocked at 1.5GHz will do the brainwork. At this time, however, there's a split in the rumors of the exact model of the SoC – either a Snapdragon S4 Pro or a Snapdragon 600. NVIDIA's Tegra 3, which powered the original Nexus 7 seems to have been ditched. What about the RAM, you wonder. Oh boy, this one can really spice things up, if rumors are to be trusted – we're expecting up to 4GB of RAM for Google's upcoming bad boy. On-board internal storage will range from 16GB to 32GB, though we're hoping for a 64GB variant, as well. As usual, no microSD slot. Google seems to hate those things. Powering all of this is an alleged 4000mAh battery, which will support wireless charging. Amazing, but how much is it going to cost? An inventory screen leaked a few days ago, confirming a price that was thrown around for a while and seems plausible, considering the price point of the original Nexus 7 – $229 for the 16GB model, $269 for the 32GB. In other words – you're getting some of the best hardware available at a budget-friendly price. One key piece of information seems missing, no? We didn't forget, and we've got you covered as always. Android 4.3, as you probably gleaned already, is what you'll get on the software side. And if that isn't enough, you should sleep easy, knowing that whenever Android 5.0, or Key Lime Pie, does get released, you'll be among the first on the planet to browse its new features. If those are the specs and that is the price, then sign me up!!! We can't have everything, but I would've preferred the more energy efficient Snapdragon 600 over the S4 Pro. I'm still buying haha! google is using S4 pro in nexus 7 and moto X. i hope there is some good reason. price? similarly optimized source code? Definitely makes sense from the optimization standpoint. Just that Google never shied away from top HW at low price and with more pixel there's more rendering, I would've preferred 2013 specs. Can't complain too much though. S4 Pro & S600 are basically the same chip, the latter is just a rebranded slightly improved version at the silicon level. Else nothing new. 'Slightly improved' actually means significant in low-energy tasks and standby. The Nexus 4 does 32hr endurance the S4 LTE 69hr. The Xperia Z, Find 5 and S4 Pro Nokias also drain and heat fast. The key is in the new manufacturing method. Simply put, SD600 is THAT much efficient. Are you semi or fully retarded? Have you seen benchmarks? The "A15" Quadcore chips destroy the likes of the Nexus 4. Real life performance is identical between the two of them and they have the same GPU. CPU power has huge diminishing returns when the hardest thing your device is doing is loading web pages. Benchmark scores mean nothing, they're just an indicative of how the SoCs handled the battery of tests thrown at them. One must be stupid to make assumptions from such things. The experience on any modern high end SoC is the same across all devices, it doesn't make any difference to the end user. Ever thought about future-proofing? Think about it. My next tablet for sure! in what time the event will begin? What about the next version of the Nexus 10? Have had one since January and my only complaint is lack of a SD card slot. Great specs and good price. Nexus tablets and phones are following the footstep of Apple for not providing sd slot, the good for Apple they have 64 gig variant unlike nexus is limited to 32 gig max capacity. I'm so jealous with people in America. It will probably cost $400 in my country. Perfect timing for back to school. Assuming they can keep them in stock.